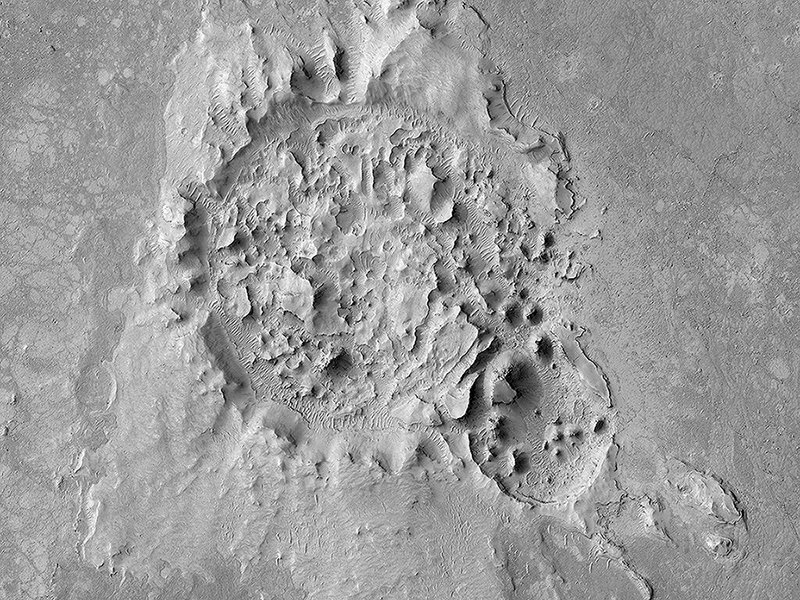 This 2.5-kilometer diameter crater has been significantly altered from the usual bowl-shaped appearance we associate with craters. Material has covered significant portions of the ejecta and filled in the crater. 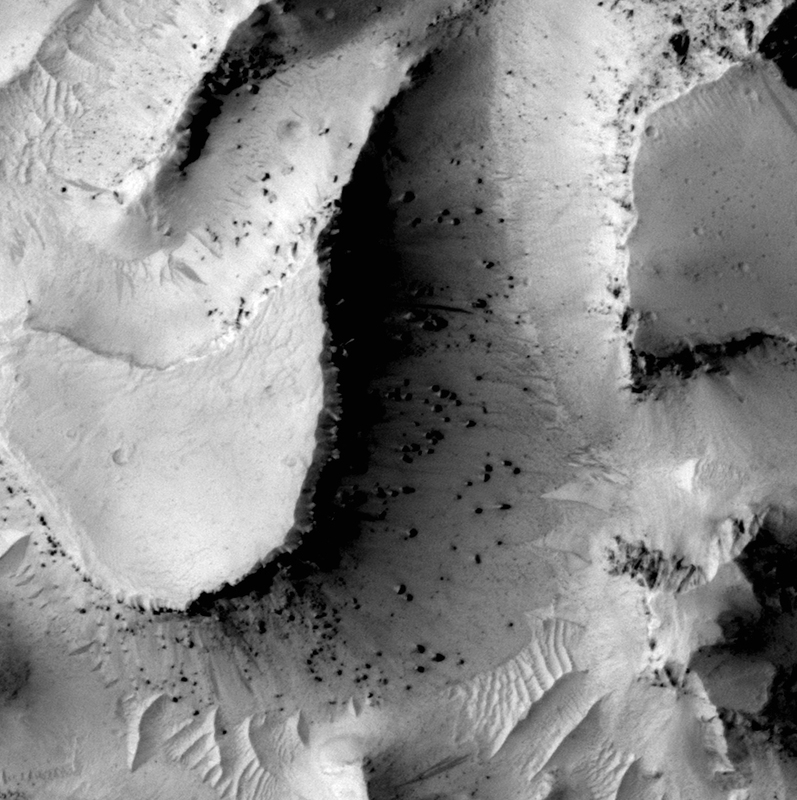 This fill material has since been subject to erosion—like boulders weathering out of the slopes—and the crater rim is also highly irregular. This is a stereo pair with ESP_045319_1830. 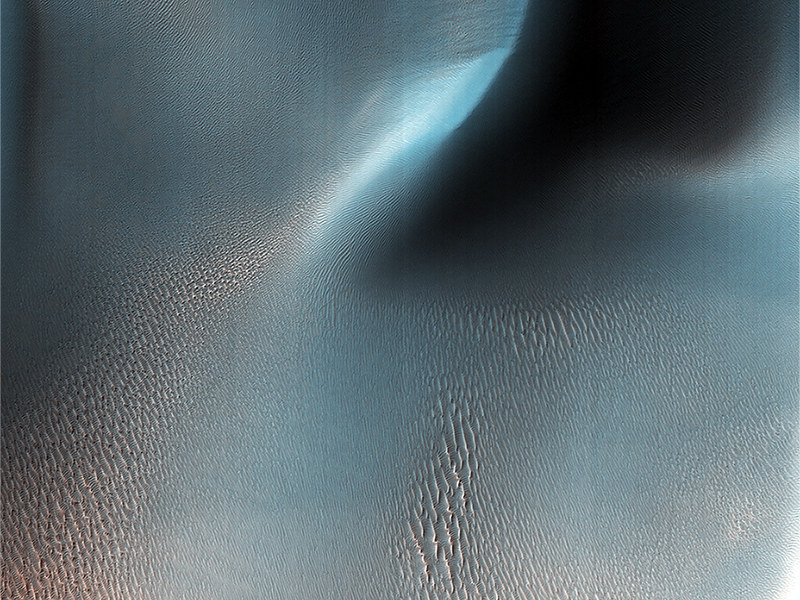 We find two types of wind (aeolian) features in Proctor Crater: large, dark features that are sand dunes, made up of basaltic particles, and smaller, light-toned ripples that we call “TAR”, or “transverse aeolian ridges.” The origin of the TARs is a mystery. They might be dust deposits, or perhaps coarse grained ripples that are coated in bright dust. These TARs are less than 10 meters tall, and are much smaller than the sand dunes that reach impressive heights of over 130 meters. 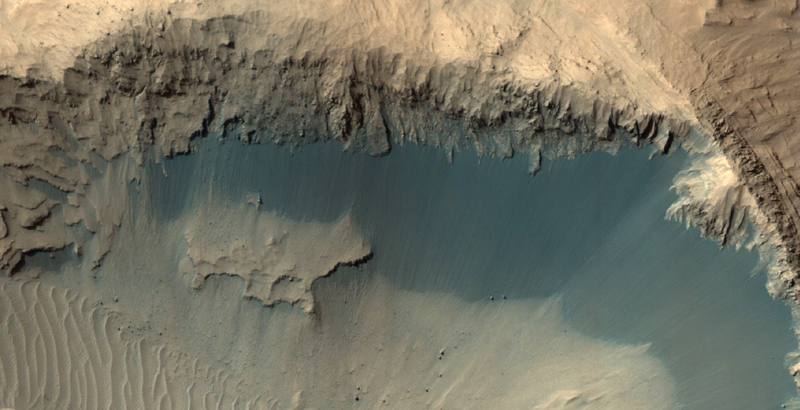 In other places on Mars, TARs are generally older than sand dunes, but here in Proctor Crater, it is not so obvious. How can we tell which came first, the TARs or the dunes? 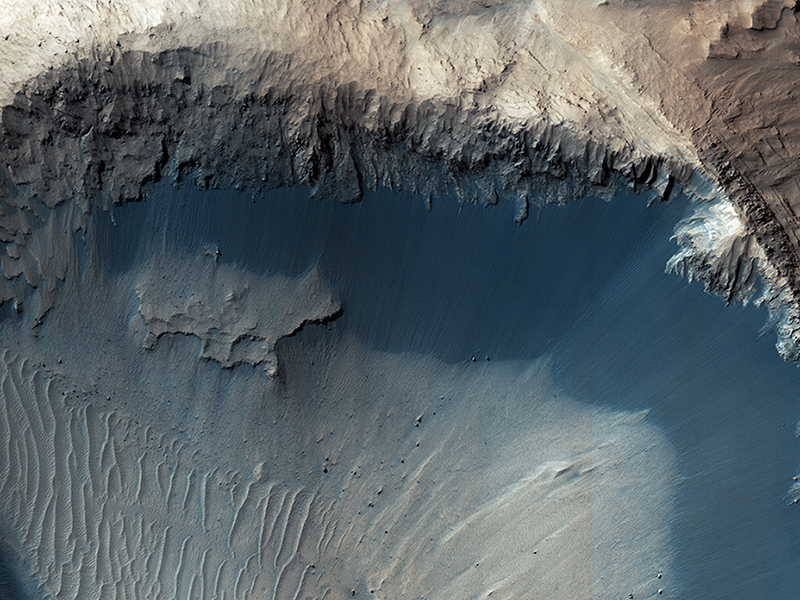 Fortunately, HiRISE has a tool that can solve this riddle. By taking stereo images of the same region from two different locations, we can estimate the topography of the region by measuring the displacement of surface features from one picture to the other. The result is a quantitative estimate of the local surface topography, called a digital terrain model. If you compare two digital terrain models (Figure 1 and Figure 2, see below) that we’ve made of this same area, it is obvious that the TARs appear at lower elevations in the gaps between the dunes. 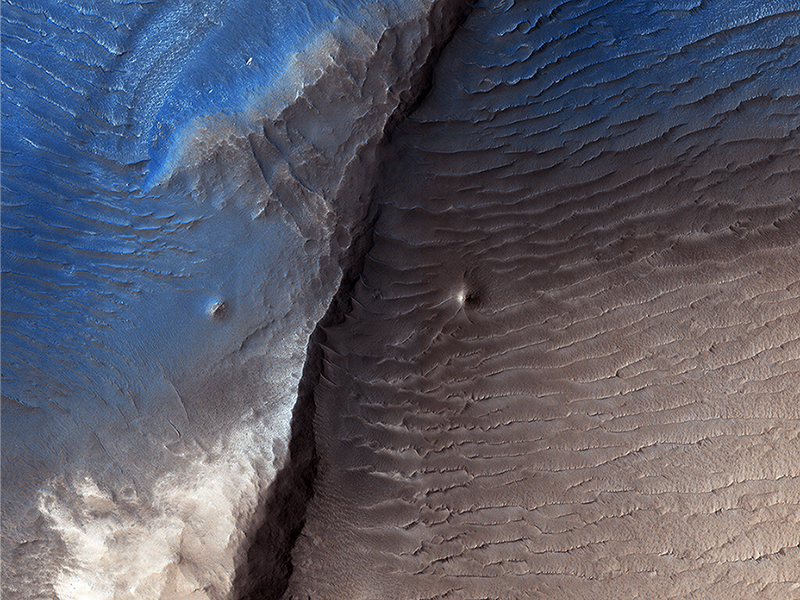 The dunes are situated on top of the TARs, and with this information, we can say the dunes are clearly the younger formations here in Proctor Crater. Figure 1 is a DTM of the margin of the Proctor Crater dunes created from previous observations during previous orbits. It is color coded such that blue represents the lowest elevations, followed by green and yellow and red at the highest elevations. Figure 2 is the HiRISE image taken during orbit 4077 (PSP_004077_1325) that has been geometrically corrected to appear as if it was taken from directly above the region. This image and the processes described therein was suggested and studied by Ariana Boyd (University of Tennessee).